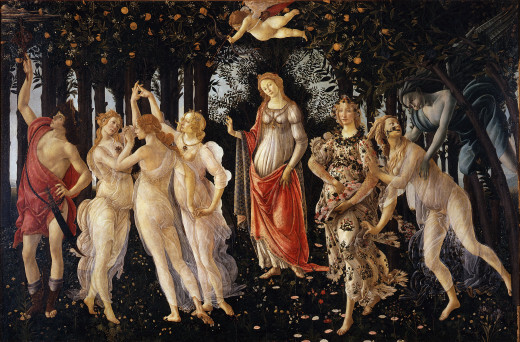 Primavera (Spring) is an Early Renaissance painting by Sandro Botticelli. Painted in 1482 it has become one of the most popular paintings in Western art. 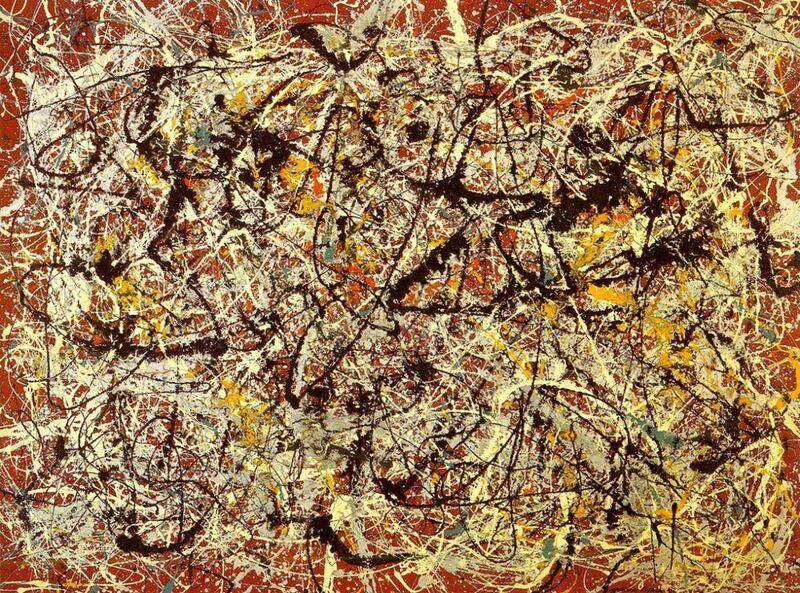 The meaning of the painting is still widely debated. Botticelli's painting was most likely commissioned by a member of the Medici family, which member of the family though is not certain. It was first written about and seen at the villa of Lorenzo di Pierfrancesco de' Medici at Castello. Recently though scholars believe it may have been first placed at Lorenzo de' Medici's town house in Florence, only later to appear at the Castello. Castello was also home to The Birth of Venus, Botticelli's other famous painting. Little is known about the early life of Botticelli, but he was born in Florence in 1445 with the name Alessandro di Mariano di Vanni Filipepi. He would more commonly be known as Sandro Botticelli. 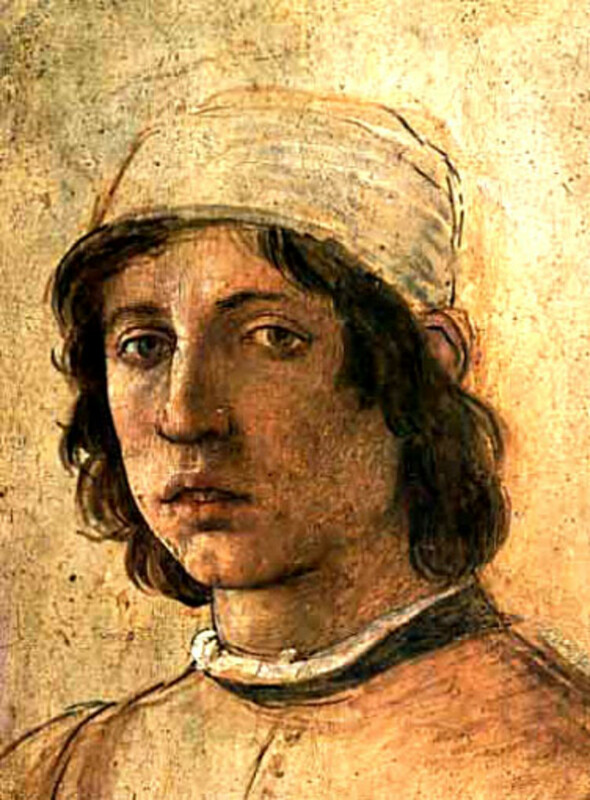 Botticelli, meaning little barrel, was a nickname given to his older brother that was also passed on to him. At the age of 14 he began an apprenticeship as an artist. This took him off the course of being a goldsmith, which was set by his older brother. It's believed that by the age of 17 Botticelli had begun an apprenticeship under the the painter, Fra Fillipo Lippi. With a master like Lippi, Botticelli learned about the finer details in painting, and he learned how to create more intimate expressions in his art. By the age of 25 Botticelli had opened his own workshop and began taking commissions. 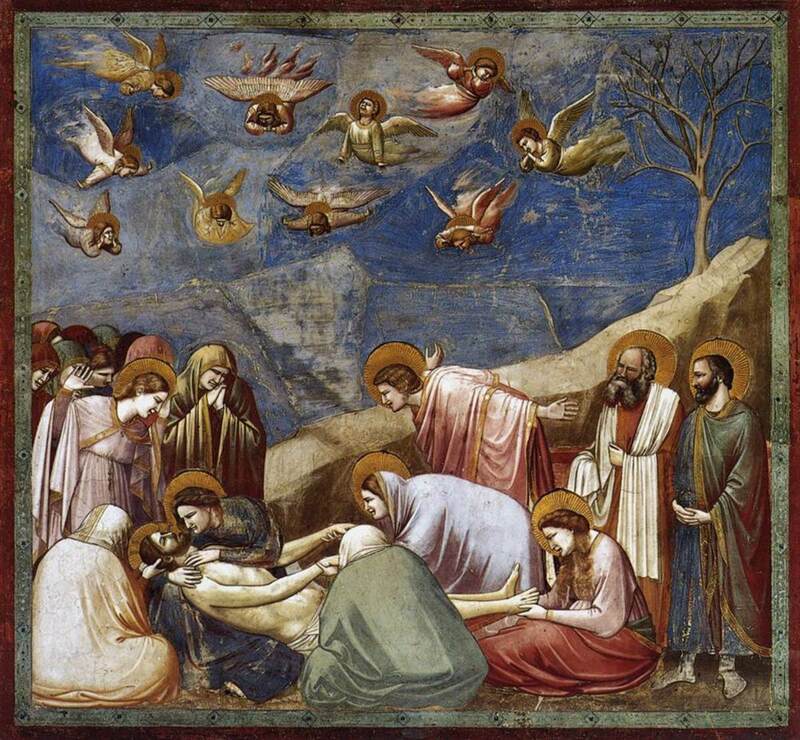 In 1481 Botticelli headed to Rome under orders from Pope Sixtus IV to fresco the walls of the Sistine Chapel. After a successful visit to Rome, Botticelli returned to Florence and began working on a printed version of the Inferno by Dante and eventually on Primavera. From Right to Left the following people can be seen in Primavera. All the way to the right, the blue green thing is Zephyrus, also called the west wind, he has his hands on Chloris a nymph. To the left of Chloris is Flora, the Goddess that Chloris transforms into. At the center of the painting is Venus and above her with the bow and arrow is Cupid. The three women holding hands in a circle are the Three Graces. Finally, the man all the way to the left is Mercury. The primary reason why the people are listed from right to left in the above description is because that is the most commonly argued school of thought in regards to this painting. 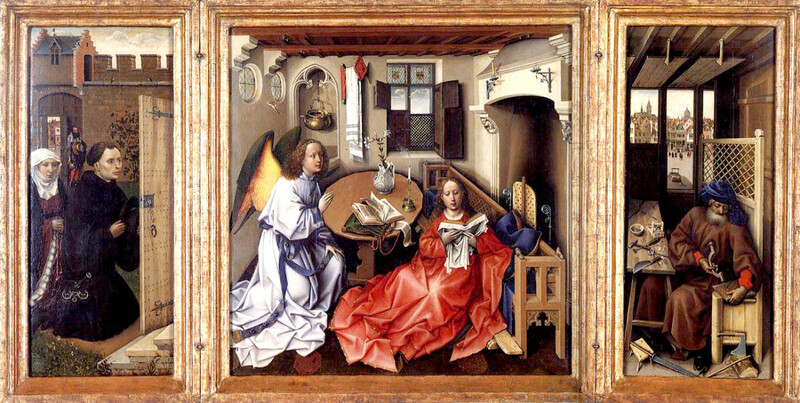 That school believes that Primavera are series of episodes that move from left to right across the painting. Looking at Chloris and Zephyrus, Chloris looks surprised and afraid as she is grabbed from behind by Zephyrus. According to the story, Zephyrus transforms Chloris in to Flora, the Goddess of Spring. The moment Chloris is transformed into Flora, flowers emerge from her mouth, which is depicted in the painting. Flora who is believed to be standing to the left of Chloris and Zephyrus is the completely changed, and new form of Chloris. Flora wears a dress with lots of flowers and a reef around her neck, both symbols of Spring. Venus is the Roman God of love and beauty. In this painting she stands at the center and above her flies Cupid, who is blindfolded while armed with his bow and arrow. Venus's belly is swelling, which suggests she is pregnant. Behind her is a myrtle plant which represents sexual desire. Birth and love are two commonly associated images with Spring, which is why Cupid is in the painting, and that's why Venus is in the painting and pregnant. There placement in the center may be suggesting that love is the heart or the center of Spring. The Three Graces existed both in Greek and Roman mythology and usually represented charm, beauty, and creativity. In the painting they are seen holding hands with one another; two face the viewer while one has their back turned, this is the usual grouping of the Three Graces. Mercury is the God of Trade, who is usually depicted as a messenger. Mercury takes a very masculine and heroic pose and is also seen carrying a sword. His hand that is pointing towards the sky is removing a cloud from the scene, which presumably would have hidden the entire painting from the viewer. The flowers and plants that surround the figures in the painting help bring a fantasy like landscape for the people in the painting to exist in. The plant life is painted in a naturalistic style and great attention to detail can be observed. Over 500 identified species of flowers and plants have been documented in the painting. Other interpretations to the work have said the painting is a documentation of the seasons from February (Zephyrus) to September (Mercury). Some interpretations argue that the painting is about Neoplatonic love. Despite the numerous interpretations out there, these are only a few, there almost always seems to be an underlying idea that ideals cannot be realized in this painting. The removal of the clouds from the scene, the transformation of Chloris into a beautiful Goddess, the pastoral background which goes above and beyond what was expected at the time creates ideals that are other worldly. These are ideals that can not be realized in our world, and that is something that can be argued is underlying to all possible interpretations of this painting. This article focuses on the Flemish painter's life and arguably his most famous painting Descent From The Cross. Van Der Weyden pays tribute to the crossbow guild that commissioned him in the painting by featuring several hidden crossbow images. The Portinari Altarpiece is an Early Renaissance painting by Flemish painter Hugo Van Der Goes. The painting depicts a Nativity scene focusing on the Adoration of the Shepherds on three panels. 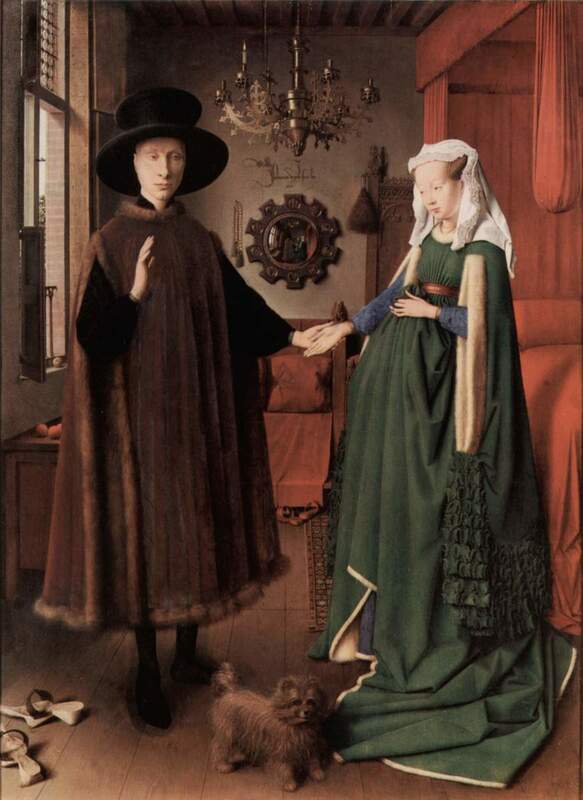 The Arnolfini is one world's earliest oil paintings and is arguably one of the earliest examples of a genre painting. 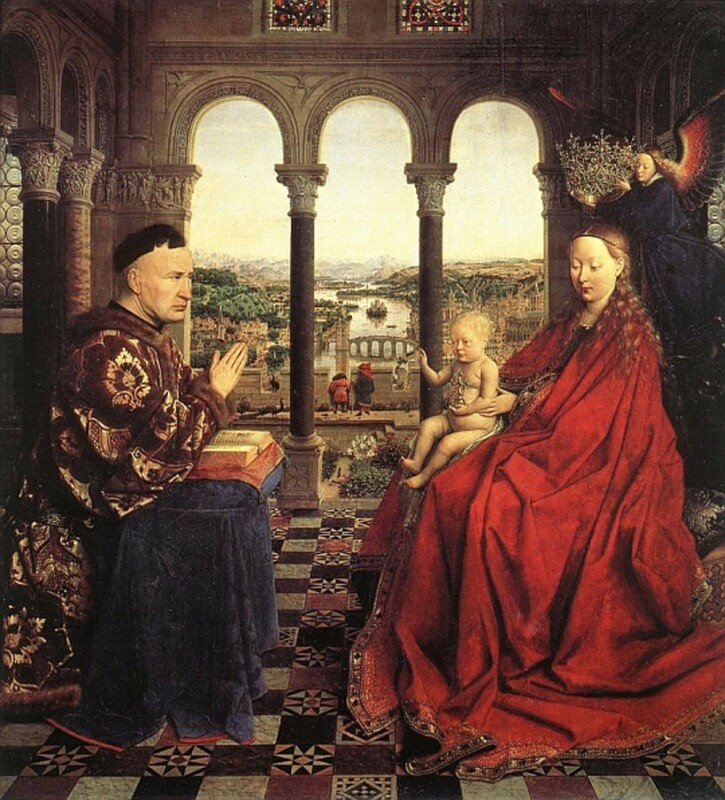 With this painting Jan van Eyck helped to encourage the trend to make more realistic looking paintings. Hello DafodilSky thanks for reading and voting up. I envy your visit to this painting in Florence, I hope to make a trip there at some point in my life. I have not read the Botticelli Secret, but I'm going to look into it now that you've mentioned it. One of my favourite paintings - lucky enough to have visited it in Florence and also the Medici Villa at Castello. Have you ever read an insane but very enjoyable book called "The Botticelli Secret" by Marina Fiorato? The symbolism in this painting is the key to the story...voted up. Hello forbcrin thanks for stopping by, I like your statement its very musical, I think that describes the painting perfectly. I was born in Spring and the first time I saw La Primavera I fell in love with it. I don't know why. The body types are not my favorite, but there is something in the general air of the painting... It is also very musical to me.